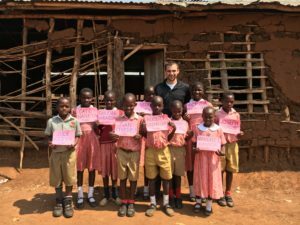 Two weeks ago, I was overcome with joy as I spent a week in Uganda! The transformation and impact ServeNow is having is inspiring. 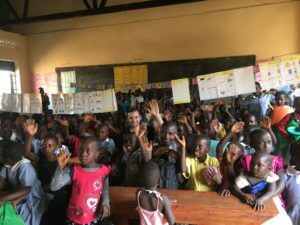 For example, as I dedicated the newest School Building (You can watch a short video on that here: Uganda School Building Dedication), I was informed that this will make possible an education for 1,000 more disadvantaged children…if they also find monthly sponsors to cover their small tuition costs. If interested in sponsoring a child for $37 a month please feel free to contact us for more information. It was meaningful to meet most of the children sponsored by ServeNow partners and hear their stories. One boy, Shadrach, is the youngest of his siblings. His dad left them when they were small, and his mom was very poor. They struggled so much that to survive they would eat bark off trees. Shadrach however found a sponsor and is the only one in his family to receive an education. He even became a part of the choir and traveled to the US a few years ago! 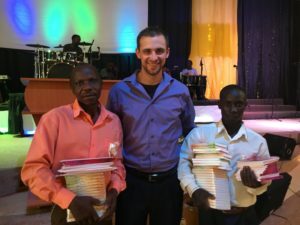 While in Uganda, I spoke at a pastor’s conference, where we began giving out 25,000 New Testaments and the next four books in the Basic Series. These Scriptures and discipleship resources are in their native language of Luganda. Many of these pastors have believers in their congregation without any Scripture of their own. We also gave bicycles out to a group of pastors. It was thrilling to see the joy on their faces as they tested out their new bikes! 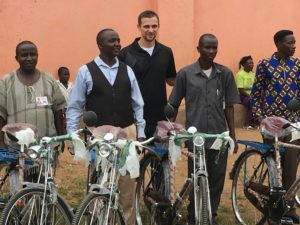 I shared with them that it is our prayer that these bicycles would help them “speed up the spreading of the Good News.” These bicycles are their only means of transportation. Prior to this they walk hundreds of miles by foot to serve. 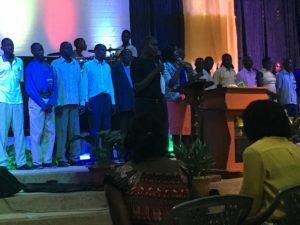 There are another 500 bicycles needed for other pastors among this network in Uganda alone! To watch a video of some of them enjoying testing out their new bikes click here: Pastors in Uganda Receiving a Bicycle. At the conference was also a group of pastors from Sudan. 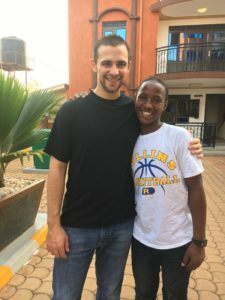 However, they are currently living in a refugee camp in Uganda. In this camp, there are one million refugees. On the last day of the conference, we had them come up on stage and we prayed for them. Many of them stood there or kneeled with tears streaming down their faces because so many of their wives and children have been killed. At that moment, and in spending time with them, I wanted to serve them in some way. One of the greatest needs was for our Basic Series discipleship booklets. Interestingly many in the refugee camp can speak English or Arabic, and the Basic Series have already been translated in these languages. We only have a few days until the end of the calendar year. We do not yet know how the new tax laws will affect charitable giving next year, but any gift post marked no later than December 31 will be tax-exempt to the fullest extent of the current law. We are praying for $100,000 in these next few days and before the new year begins. This will help us finish this year strong and not negatively affect any projects heading into next year. If you can help in any amount, there will be thousands grateful around the world that we aim to serve together! Wishing you a very blessed 2018!